So we just ended our first quarter in the Second grade! The kids are now pretty settled in their class and the work flow of school and it seems like we are staying afloat. Me included! Approaching Second Grade, I felt a bit anxious. I felt like one of my twins was going to need some extra work or tutoring, because of some reading struggles. Despite our efforts to read more during the summer, there was still some difficulty with the pronunciation of English words. Spanish was better, but I felt like he should be at a higher level. This worried me because reading is so critical for all of their school work. As the first weeks passed, I had a moment with my son that was really the game changer. You see, my son has always approached everything cautiously and at his own pace. Whether it was potty training, jumping in a pool, playing sports, and now, it's reading. And as his parents, we understand how he works and let him "do him." But there always comes this point where he needs a push. It takes some real talk from Mom and Dad, to show him that we are not backing down and that we cannot conquer that fear for him. With reading, we never wanted to get after him for not trying hard enough, because it would only discourage him. But when reading out loud, he would read in such an unsure and timid voice. I knew it was fear preventing him from saying the words correctly. And that was the moment that I knew I had to be straight with him. I told him that I know that reading in English is not that easy for him, Spanish words are easier to pronounce. And that I was so proud of him for learning two languages at the same time and how awesome of an accomplishment that is! But in order for him to figure out the words, he had to sound it out, en voz alta. I told him that he needed to hear the sounds in a strong voice. I said the words myself in a soft voice and in a stronger voice, so he could hear the difference. And I said that I wanted to hear him read in a strong and confident voice. And so we continued. When he started in a small voice, I was uncompromising and had him start again. He would kind of look at me and smile. He was trusting and was so happy when he read the word aloud. Finally, I told to him that I was confident in him. And that I wanted him to succeed in school and make good grades. And I know that his heart wants to read well too. Now, I know that this doesn't work for everyone, but I have seen a change in my little 7 year old. Within weeks, his reading has improved in English and Spanish. I know that just being in school has helped him progess, but I like to think that our strong encouragement played a part as well. So, that's where we stand. At home, our goal is to master all of the #1 Ready to Read books, in English and Spanish. We are almost there! And once he can read those at a good pace, with little to no help, we will pass those book aside, to younger children in our family. I'm hoping that it will be a great visual for him and help him feel more accomplished and confident! Next, we will conquer Level 2 and work for better comprehension. Has your child had similar struggles? 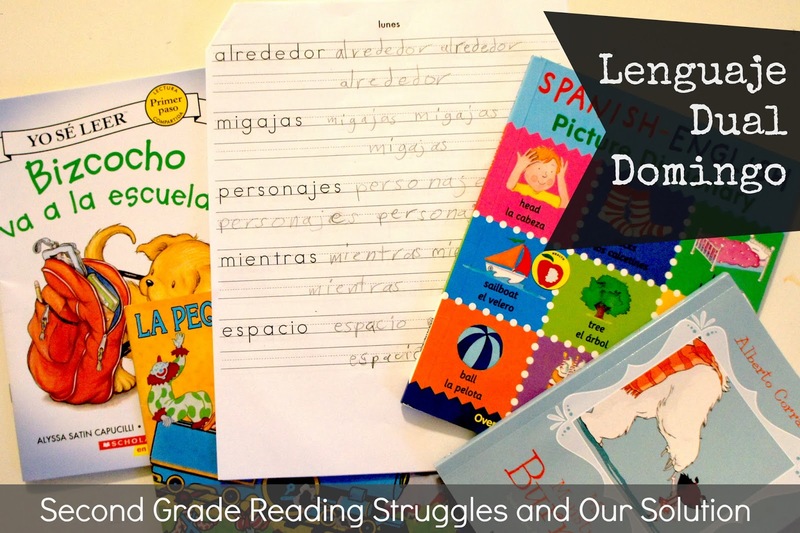 I'd love to hear about your ideas for helping dual language and bilingual readers!